The cover of the first volume featuring Gabriel White Tenma. Gabriel DropOut (Japanese: ガヴリールドロップアウト, Hepburn: Gavurīru Doroppuauto) is a Japanese manga series written and illustrated by Ukami. The series began serialization in ASCII Media Works' Dengeki Daioh G magazine in December 2013 and is licensed in English by Yen Press. An anime television adaptation by Doga Kobo aired in Japan between January and March 2017. Upon passing a school in heaven, graduating angels are sent down to Earth, where they must learn about humans and guide them towards the correct path in order to become true angels. However, Gabriel White Tenma, the top angel in her class, becomes addicted to video games upon arriving on Earth and turns into a complete slob as a result. The story follows Gabriel, along with other angels and demons who have descended to Earth, as they attend high school. An angel who was the top of her class but turned into a slob after becoming addicted to video games. She is often lazy and unmotivated and has ignored or lashed out against anyone trying to order or boss her around. The complete opposite of Gabriel, she is very responsible and often looks after Gabriel, contrary to her actual role as a demon. The only exception where Vignette acts manipulative or threatening is to do things she enjoys; like celebrating Christmas (despite being a demon) and forcing Gabriel into a cute cat costume. An egotistical, childish and bratty demon who often thinks of weird or immature ways to cause mischief, which usually end in failure. She has no sense of taste and is often pestered by Raphiel and stray dogs; the latter which constantly steals her beloved melon bread. She is frequently bullied or humiliated by her "friends" and is easily tricked due to her incompetence. The second ranked angel in Gabriel's class, who (despite normally having a constant angelic smile) has since become a sadistic stalker who takes delight in teasing and manipulating Satania. She is afraid of frogs. An underclassman angel who admired Gabriel in angel school and presumes Satanichia was the one responsible for turning her into a slob. She also knows of Vignette and calls her senpai (senior) for her kindness, but knowing she is a demon, distrusts her. The class president of Gabriel's class, who is unaware that Gabriel is an angel and often finds her actions bewildering. The owner of a coffee shop where Gabriel works part time. He is often bewildered by Gabriel's behavior, but assumes it is just because she is a foreigner. Ukami began serializing the manga series in ASCII Media Works's shōnen manga magazine Dengeki Daioh G on December 27, 2013, where it was published every other month. Starting on April 28, 2014, the series switched to monthly publication. It has been published in 7 compiled volumes as of December 22, 2018. The series has been licensed in English by Yen Press. An anime television adaptation of the series was announced in the Dengeki Daioh magazine's September 2016 issue on July 27, 2016. The anime is produced by Doga Kobo and directed by Masahiko Ohta, with Takashi Aoshima handling series composition and Katsuhiro Kumagai designing the characters. The series aired in Japan between January 9, 2017 and March 27, 2017 and was simulcast by Crunchyroll. The first episode had an advance screening on December 18, 2016 at the Shinjuku Piccadilly theatre in Tokyo. The opening and ending themes respectively are "Gabriel Dropkick" (ガヴリールドロップキック, Gavurīru Doroppukikku) and "Hallelujah Essaim" (ハレルヤ☆エッサイム, Hareruya Essaimu), both performed by Miyu Tomita, Saori Ōnishi, Naomi Ōzora, and Kana Hanazawa. The ending theme for episode 7 is "Gabriel no Kazoeuta" (ガヴリールの数え歌, The Gabriel Counting Song) performed by Ōnishi. The anime ran for 12 episodes and released across three four episode BD/DVD volumes. Two original video animation episodes were released with the first and third BD/DVD volumes released on March 24, 2017 and May 24, 2017 respectively. "The Day I Knew I Could Never Go Back"
Graduating from Angel School at the top of her class, an angel named Gabriel White Tenma is sent down to the human world to live as a human and guide people towards happiness. Upon discovering the world of video games, however, Gabriel quickly becomes addicted and devolves into a worthless slob. This proves to be an annoyance for her neighbor, a demon named Vignette April Tsukinose. Meanwhile, another demon named Satanichia Kurumizawa McDowell tries to do demonic deeds, only to discover the acts of indecency by Gabriel outweigh her own. Later, Vignette gets Gabriel to clean up her room, bringing to light that she herself doesn't act very demonic, and soon comes up against a cockroach. Elsewhere, another angel named Raphiel Ainsworth Shiraha takes an interest in teasing Satanachia as she comes up against a stray dog. "The Angel, the Demon, and the Class President"
Gabriel, Vignette, and Satanichia go to the cafeteria for the first time to try some udon, where Satanichia's taste-deafness comes to light. Later, class 1-B's class president, Machiko, becomes bewildered when she overhears Gabriel and confuses her report to heaven for a careers survey. Later, Vignette tries to deal with Gabriel and Satanichia as they end up diverting from the planned recipe during cookery class. Afterwards, Raphiel becomes Satanichia's apprentice, sneakily manipulating her into following her orders instead. "Friends, Work, and the Summer of Bugs"
Wanting to earn more money for her games, Gabriel takes up a part-time job at the Coffee Angel coffee shop, her crass attitude proving bewildering for the shop's master. Meanwhile, Vignette spends some time with Raphiel to try and learn more about her. Later, Satanichia shows up at Coffee Angel, much to Gabriel's chagrin. On a sunny day, Gabriel becomes bothered by her broken air conditioner and a bunch of mosquitoes and spends the rest of the day at Vignette's place. The girls make plans to take a trip to the beach for summer vacation, much to Gabriel's dismay. Despite having no experience with human beaches, the others attempt to teach Gabriel the fun of playing at the beach. Later, as the girls get together to finish their summer homework, Vignette tells the others about how she came to meet Gabriel prior to her transition into a slob. "The Angel Whose Illusions Were Shattered Like Hell"
Tapris Sugarbell Chisaki, a middle school angel who strongly admired Gabriel, is shocked to see how much of a slob she has become. As Tapris believes this to be the work of a demon, Raphiel, looking for some amusement, decides to set her up against Satanichia, who smugly takes credit for Gabriel's downfall. After losing a game of Old Maid to Satanichia, Tapris finds comfort in Vignette's kindness, only to become distant when she learns that she is a demon. Afterwards, Tapris spends the night at Gabriel's apartment where she witnesses her slobbiness firsthand, but still gets a small glimmer of hope. Wanting to get revenge on Gabriel, Satanichia buys a revolver from the Hell Shopping Network that causes whoever it shoots to wind up in a laughing fit. After this plan ends up in failure, Satanichia faces Gabriel in a game of shogi, only to once again lose due to Gabriel playing by her own rules. Later, the class president winds up as Satanichia's sketching partner in art class, having to resort to riduculous demands to try keep her motivated. On Halloween, the girls go trick-or-treating at Gabriel's apartment, where Vignette attempts to get Gabriel to wear one of her costumes. With her allowance from Hell decreasing due to not acting like a demon, Vignette asks the coffee shop master for advice on how to perform bad deeds. Later, Vignette struggles to get some sleep when she catches a cold, after which Gabriel pays her a visit. Raphiel finds herself with an overly tight bra when the class has to take a physical fitness exam, having to restrain her movements to keep it from breaking. However, she ends up putting her dignity on the line in order to keep Satanichia from winning every event. Later, Vignette and Satanichia take part in an interview exam, with the latter following some bad advice from a book Gabriel recommended to her. On another day, Gabriel sits in on Machiko's cooking club in order to get a free meal while Satanichia discovers one of Raphiel's weaknesses on the way home. "Christmas and New Year's Eve Surprise"
Vignette tries to host a peaceful Christmas party without Satanichia realising the holiday's connections with the birth of Jesus Christ. Later on New Year's Eve, the girls make a visit to the shrine, where Gabriel gets drunk on amazake. Afterwards, as the girls make home visits to Heaven and Hell respectively, Gabriel attempts to sneak her entertainment devices past Heaven's security with little success. "The Angels and Demons Return Home"
Upon returning home, Gabriel finds herself having to play various games with her younger sister, Haniel. Meanwhile, Vignette is shocked to find the baby monster she took in a year ago, Chappy, has grown to an enormous size, while Raphiel has to deal with her perverted butler, Mariel. Later, Gabriel and Raphiel are called in to report on their findings in the human world, with Gabriel using her experience with online games as a reference point, before deciding to help Satanichia sneak into Heaven to relieve their boredom. Satanichia ends up rescuing the stray dog that keeps stealing her melon bread from being taken to the pound, only to realise her apartment doesn't allow pets. Having no money to move and unwilling to find another owner, Satanichia attempts to run away with the dog to find a new place to live. Luckily, Gabriel manages to convince the coffee shop master, who owns the apartment complex where Satanichia lives, to allow her to keep the dog at her place. Meanwhile, Tapris attempts to learn how to use a PC in order to help Gabriel finish her online games quicker, only to have to learn everything about computers from scratch. Later, Tapris joins the others for a takoyaki party before informing Gabriel that her older sister, Zelel, will be visiting. Fearing that Zelel might destroy the world if she discovers she has become a fallen angel, Gabriel attempts to appease her by acting like a model little sister. This plan fails, however, as Zelel was already aware of Gabriel's transgressions. After a week of severe punishment, Gabriel returns to school as the model angel she used to be before her game addiction. Finding that they prefer the slobbish Gabriel, the others try to convert her back, only to discover she was putting on an act in front of Zelel. When Zelel inevitably finds out about this ploy, she contemplates moving in with Gabriel in lieu of dragging her back to Heaven, only to get scared away by Satanichia's dog, allowing Gabriel to continue her slob life in peace. "A Steamy Special ~A Certain Demon's Plan to Defile an Angel's Pure Skin~"
As the girls go on a trip to a hot spring inn, Satanichia seems determined to get Gabriel to get in the baths with her. After eventually managing to convince Gabriel to do so, Satanichia brings out a giant slime to attack her, only for it to ensare everyone else instead. The girls meet a near-blind girl, who seems to recognise them as angels through her imperfect vision. As they each give the girl their support, they learn that she will be undergoing a risky operation which will either fix her eyesight or rob it completely. A few days later, the gang are shocked to discover the girl has been hit by a car, leaving her in critical condition. Wanting to save her, Gabriel goes against Heaven's rules and uses her angelic powers to save the girl and restore her eyesight. Managing to get away with light punishments for her actions, Gabriel is relieved to see the girl return to having a normal life. ^ All English titles taken from Crunchyroll. ^ a b c d "Gabriel Dropout Manga Gets Anime From Himoto! Umaru-chan Staff". Anime News Network. July 26, 2016. Retrieved July 28, 2016. ^ "Crunchyroll Announces Winter 2017 Anime Lineup". Crunchyroll. January 20, 2017. Retrieved April 17, 2017. ^ "Animax Asia to Air Gabriel Dropout, BanG Dream! Anime". Anime News Network. January 4, 2017. Retrieved January 5, 2017. ^ a b c "BD/DVD" (in Japanese). Retrieved March 30, 2017. 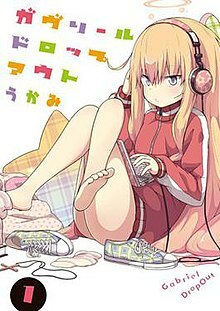 ^ a b c d "Gabriel Dropout anime about a lazy angel reveals main cast in 1st promo video". Anime News Network. August 11, 2016. Retrieved August 11, 2016. ^ a b c "TVアニメ「ガヴリールドロップアウト」公式サイト。 登場キャラをご紹介！" (in Japanese). Doga Kobo. Retrieved February 13, 2018. ^ コミック電撃だいおうじVOL.4. Dengeki Daioh G (in Japanese). December 27, 2013. Retrieved July 27, 2016. ^ コミック電撃だいおうじVOL.8. Dengeki Daioh G (in Japanese). April 23, 2014. Retrieved July 27, 2016. ^ "Yen Press Licenses Gabriel Dropout, Sword Oratoria, Hybrid x Heart Manga". Anime News Network. March 24, 2017. Retrieved March 30, 2017. ^ ガヴリールドロップアウト(1). ASCII Media Works (in Japanese). Retrieved July 27, 2016. ^ "Gabriel Dropout, Vol. 1". Yen Press. Retrieved January 23, 2019. ^ ガヴリールドロップアウト(2). ASCII Media Works (in Japanese). Retrieved July 27, 2016. ^ "Gabriel Dropout, Vol. 2". Yen Press. Retrieved January 23, 2019. ^ ガヴリールドロップアウト(3). ASCII Media Works (in Japanese). Retrieved July 27, 2016. ^ "Gabriel Dropout, Vol. 3". Yen Press. Retrieved January 23, 2019. ^ ガヴリールドロップアウト(4). ASCII Media Works (in Japanese). Retrieved January 29, 2017. ^ "Gabriel Dropout, Vol. 4". Yen Press. Retrieved January 23, 2019. ^ ガヴリールドロップアウト(5). ASCII Media Works (in Japanese). Retrieved September 27, 2017. ^ "Gabriel Dropout, Vol. 5". Yen Press. Retrieved January 23, 2019. ^ ガヴリールドロップアウト(6). Kadokawa Shoten (in Japanese). Retrieved April 17, 2018. ^ "Gabriel Dropout, Vol. 6". Yen Press. Retrieved January 23, 2019. ^ ガヴリールドロップアウト(7). Kadokawa Shoten (in Japanese). Retrieved December 25, 2018. ^ "Gabriel Dropout, Vol. 7". Yen Press. Retrieved January 23, 2019. ^ Green, Scott (July 26, 2016). ""Umaru-chan" Staff Reunite On Lazy Angel Comedy Anime "Gabriel Dropout"". Crunchyroll. Retrieved July 28, 2016. ^ Green, Scott (July 27, 2016). ""Gabriel Dropout" Anime Visual Published". Crunchyroll. Retrieved July 28, 2016. ^ "Crunchyroll Adds "Gabriel DropOut" to Winter Anime Simulcasts". Crunchyroll. December 29, 2016. Retrieved March 30, 2017. ^ Komatsu, Mikikazu (October 10, 2016). "TV Anime "Gabriel Dropout" Confirms January 2017 Premiere". Crunchyroll. Retrieved October 10, 2016. ^ a b "Gabriel Dropout Anime Gets Hot Springs OVA". Anime News Network. February 3, 2017. Retrieved February 3, 2017. ^ "STORY" (in Japanese). Retrieved March 30, 2017. This page was last edited on 21 April 2019, at 14:09 (UTC).